After the incendiary, in-your-face comeback single Yuk Foo, Wolf Alice have spun on their heels and released a shimmering indie-pop song that's quite possibly their best single yet. Don't Delete The Kisses is "the most synth-heavy tune we've made", the band told Beats 1 - and, sure enough, it sounds like it's been beamed in from the soundtrack to a lost John Hughes movie. Or, more accurately, a John Hughes script shot by Nicholas Winding Refn. 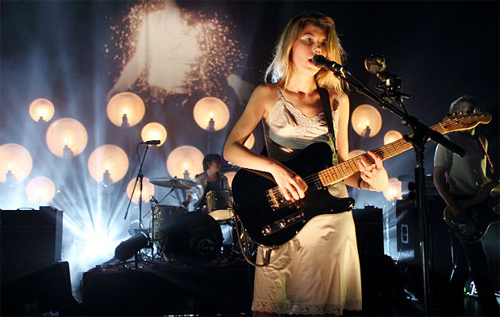 In the spoken-word verses, Ellie Rowsell plays a girl who can't strike up the courage to approach the object of her affections. The chorus lets out all that frustrated energy with a cathartic cry of, "Me and you were meant to be in love!" "I kind of wanted to make one of those head out the window on a long drive tunes," Ellie told Beats 1. "And I wanted to try my hand at like a hold-nothing-back love song. Those were my thoughts. But other than that I just kinda let it go where it wanted to go... I just think if you hold back it will sound worse won't it?" Don't Delete The Kisses comes from Wolf Alice's second album, Visions Of A Life, which is out in September. The band revealed the (unbelievably creepy) artwork on Twitter last night as they set off on a month-long US tour.